Thanks very much for the support Gerald and I spent a great amount of time making sure it would become a quality film and book. My brother Chris Bove is an editor for PBS so he had the experience to bring together the footage in a very creative way. I'll admit my own music library increased after the fact as well haha. Just wanted to let the French-speaking community know, we have the Rhodes documentary MP4 version translated into French on our website. Would love you to spread the word abroad! As well, we're beginning to post some webisodes from the former CBS Musical Instruments staff, not found in the film. Enjoy! 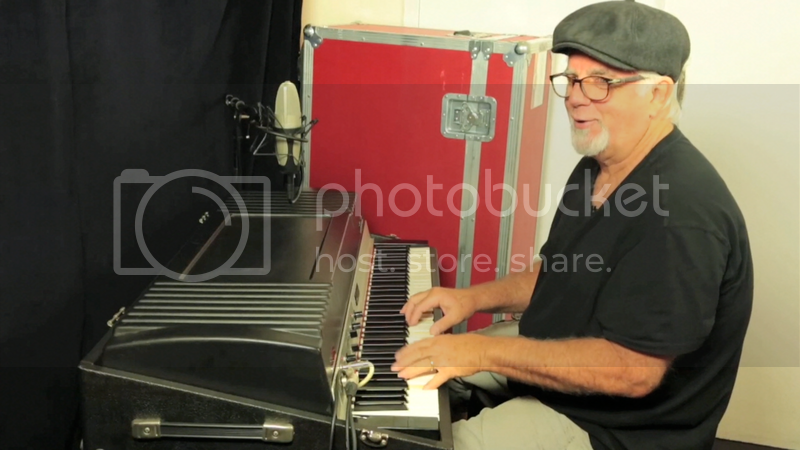 Here is a webisode with Steve Woodyard, many of you may have seen his name in discussions about Rhodes over the years as a key contributor to the piano and personal friend of Harold. Cool idea, we did at least try to cover the topic in the Jay Graydon webisode on youtube. A definitely historic piano. I want to get my father the Blu-Ray version with the book. When I go to the site you have several sellers listed such as Amazon. Which one do you recommend? I try to avoid Amazon if possible, and I want to make sure you get the most cut. I'm sure he's going to love it. Thanks again. Wanted to announce that we just posted an updated version of the MP4 "Rhodes Travels," a part 2 to the documentary, on our site. The latest addition to the interview line up was Michael McDonald - long awaited and exciting to have him as a part of the project! This separate, second feature includes interviews and performances from Al Jarreau with Tom Canning, Clarence McDonald, Michael McDonald, Wayne Vaughn, Brian Jackson, Robert Glasper, Kandace Springs, Mark de Clive-Lowe and Frank McComb. Wonderful! I just ordered my copy. Can't wait to watch it later tonight. Had mine as a gift from my girlfriend for christmas, great documentary, and played a massive role in assuring me that a Rhodes was for me. Ordered and payed for a MK1 73 stage 1977, arriving in the next few days. Love that story, great to hear and thanks for the support. Here to help on your 1977 if you have questions! Roy, Michael indeed plays Minute By Minute on in the video... I don't believe he mentions it by name, but that song has a phaser. Ben's video is cool because he plays it with and without the phaser. I'm familiar with all Doobie songs with Michael McDonald playing Rhodes. As far as I can remember, he used phaser, chorus, and vibrato (the vibrato was used more on earlier stuff from "Taking it To The Streets" & "Living On The Fault Line"). I was wondering if you guys know where I can find the version of girl from Ipanema with the early Rhodes in it? It's on the DVD but I can't find it anywhere online! I haven't been able to locate it in the general public, so I'd be happy to hear if it shows up somewhere. So you're behind those short "Down the Rhodes" videos on YouTube? Awesome. I'm looking forward to buying full documentary. From what I've seen on YT is is amazing. "If butter had a sound, it would sound like Rhodes piano" -someone from the internet. Hey Ben, I appear to have misplaced my DVD with the documentary on it... I am devestated and was wondering if you could provide me with somewhere to watch it online/a link to download it or something? Hey! I'll send you a message. Thanks again for your support. I just bought this book/DVD set a week ago. I'm enjoying it very very much. Thanks for taking to time to compile all this info, and for these links. I was actually wondering if there was additional footage of these gentlemen after reading their bits in the book, so I'm glad to see this thread. I bought my first Rhodes (suitcase) in 1990-91 for $125 (I had a few Rhodes over the years, and was lucky to have never spent over $150 on them, one was even given to me) but I had no idea how to tune it though. Not long afterward, an article came out in Keyboard Magazine about the Rhodes and Wurlitzer, and actually had Harold's phone number in it so I called him. He was super nice and supportive, and he sent me a manual (via snail mail), paid for the postage even. After that I became deeply interested in how the Rhodes worked. I was a kid then, the Rhodes were literally a dime a dozen because people wanted the DX (or later Kurzweil) so parts were hard to come by at times unless you salvaged another unit. He later gave me Steve Woodyards phone number to buy parts and pick his brain about stuff. At the time, Steve was one of the few sources for parts, plus his VAST knowledge etc... no one knew more about the Rhodes, and he was also very kind to me and answered any questions I had. I eventually did an album (in 2000) with my band and proudly thanked Harry in the liners. I called to tell him that I sent him an album but Margit answered the phone and told me he passed just weeks earlier... it was a heart breaking loss. While I was writing and recording the album, doing crazy effects etc with the Rhodes, I was envisioning and looking forward to an interesting conversation with him that sadly never happened. I later did an interview with Keyboard magazine and credited them for introducing me to Harry because they printed his phone number in that one issue... one of those life changing moments (I even became a contributing editor position at Keyboard Mag for a short time). Anyways, it's about time a documentary was made... kudos on a job well done! Thanks very much for the support. Fantastic story... and I think we all wish we did more Rhodes buying back in the 90s haha! It's too bad a documentary wasn't done before Harold's passing, but we hope that we covered the story as best as possible. We live in a time now where parts are much more readily available, so the outlook is great on keeping the pianos alive out there. I just purchased the book from our local Half Priced Books and I can't believe how extensive it is. This book and documentary really are a service to the musical world. Thank you from the bottom of all of our hearts. Thanks very much for the appreciation, it took many years to bring it all together. Watched the DVD again this weekend. Inspired me to dig into my sparkletop piano. That piano was a beast of a restoration! Glad to hear. Jut ordered the book and Blueray. Looking forward to reading/watching it!